This month’s carnival, hosted by Kristin at JournalingSaves, has several notebook reviews you’ll want to check out. Thank you, Kristin, for taking the time to share these reviews with us. Julie (Okami) reviews the Ecosystem Artist Journal on her blog, Whatever. The review features lots of photographs and observations about this beautiful journal. Nifty posted a great Blackwell Notebook Review over at Notebook Stories. Nifty’s journal reviews specialize in showing us how different pens behave on the paper and other essential information for notebook lovers. Check out Clement Dionglay’s Notebook Review: Flower Wow by Daycraft for a look at a floral notebook design. 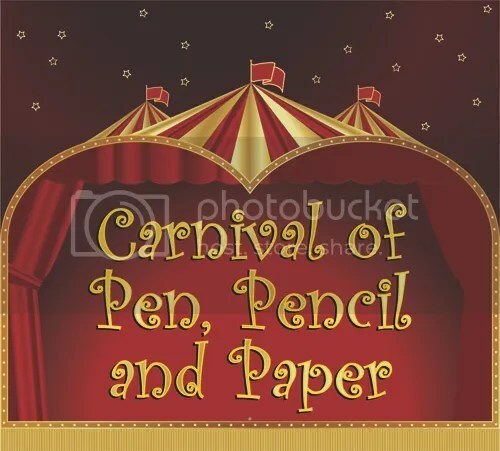 Submit your blog article to the next edition of Carnival of Pen, Pencil and Paper using our Carnival submission form. The January Carnival will be hosted by Pocket Blonde. Past posts and future hosts can be found on our blog carnival index page.